"B-2" and "Stealth Bomber" redirect here. 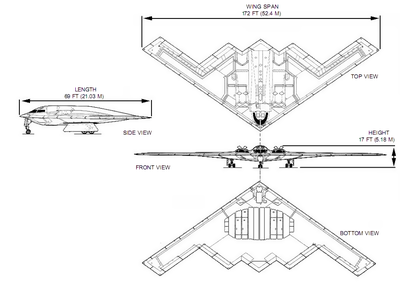 For other uses, see B2 (disambiguation) and Stealth aircraft. 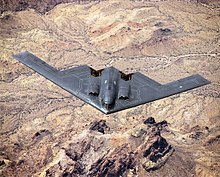 The B-2's low-observable, or "stealth", characteristics enable the undetected penetration of sophisticated anti-aircraft defenses and to attack even heavily defended targets. This stealth comes from a combination of reduced acoustic, infrared, visual and radar signatures (multi-spectral camouflage) to evade the various detection systems that could be used to detect and be used to direct attacks against an aircraft. The B-2's stealth enables the reduction of supporting aircraft that are required to provide air cover, Suppression of Enemy Air Defenses and electronic countermeasures, making the bomber a "force multiplier". As of September 2013[update], there have been no instances of a missile being launched at a B-2. 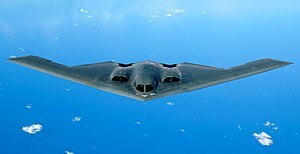 During the Iraq War (Operation Iraqi Freedom), B-2s operated from Diego Garcia and an undisclosed "forward operating location". Other sorties in Iraq have launched from Whiteman AFB. As of September 2013[update] the longest combat mission has been 44.3 hours. "Forward operating locations" have been previously designated as Andersen Air Force Base in Guam and RAF Fairford in the United Kingdom, where new climate controlled hangars have been constructed. 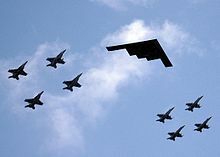 B-2s have conducted 27 sorties from Whiteman AFB and 22 sorties from a forward operating location, releasing more than 1,500,000 pounds (680,000 kg) of munitions, including 583 JDAM "smart bombs" in 2003. On 23 February 2008, B-2 "AV-12" Spirit of Kansas crashed on the runway shortly after takeoff from Andersen Air Force Base in Guam. Spirit of Kansas had been operated by the 393rd Bomb Squadron, 509th Bomb Wing, Whiteman Air Force Base, Missouri, and had logged 5,176 flight hours. The two person crew ejected safely from the aircraft and survived the crash. The aircraft was destroyed, a hull loss valued at US$1.4 billion. 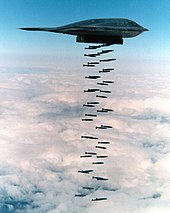 After the accident, the Air Force took the B-2 fleet off operational status until clearing the fleet for flight status 53 days later on 15 April 2008. The cause of the crash was later determined to be moisture in the aircraft's Port Transducer Units during air data calibration, which distorted the information being sent to the bomber's air data system. As a result, the flight control computers calculated an inaccurate airspeed, and a negative angle of attack, causing the aircraft to pitch upward 30 degrees during takeoff. This was the first crash of a B-2 and the only loss as of 2019[update]. 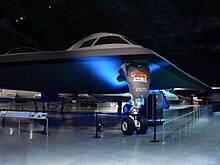 Wikimedia Commons has media related to Northrop Grumman B-2 Spirit.